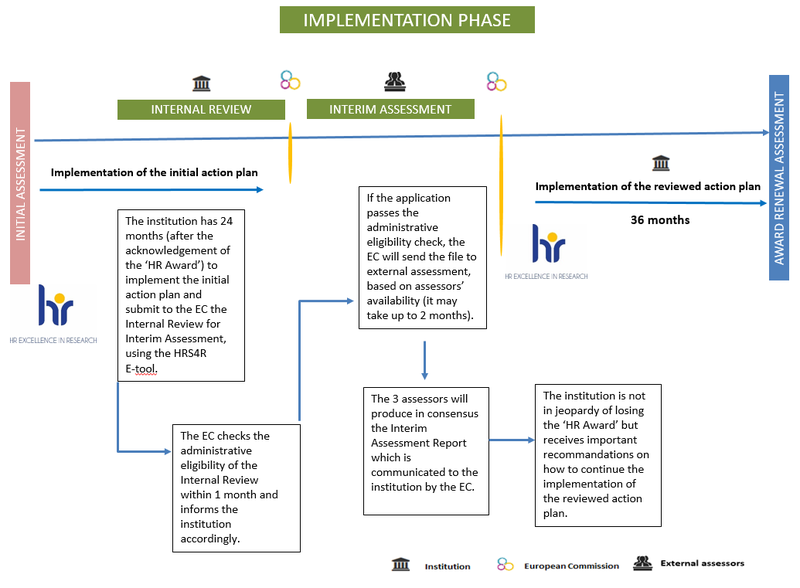 The ‘HR Award’ acknowledged institutions have 24 months to implement the actions outlined in the initial Action Plan and report on their progress in the HRS4R E-tool, based on a dedicated Internal Review form, with a view to the Interim Assessment. The institution is not in jeopardy of losing the "HR Award" but receives important recommendations on how to continue the implementation of the revised action plan for the next 36 months. For detailed information regarding the use of the HRS4R e-tool for the Internal Review for Interim Assessment, please consult the technical guidelines below. Download The Technical Guidelines for the Implementation Phase – Interim Assessment (1.44 MB) . N.B. The institution will have access to the consensus report within approximately three months after the confirmation of the administrative eligibility check.